MINNESOTABRED.COM | What is a Minnesota-bred? MTA 2018 Yearling Sale – August 19th – 4:00 p.m.
1. The broodmare must be registered with the Minnesota Racing Commission. 2. Prior to foaling, a broodmare must be in Minnesota and registered or the registration renewed with the Racing Commission or official registering agency on or before March 15 of the year in which the broodmare will foal and must remain in Minnesota until foaling. The broodmare’s original jockey club certificate must be received by the Racing Commission or official registering agency. 3. The foal must be registered with and certified by the Minnesota Racing Commission. 4. Within 30 days of the date a horse is foaled in Minnesota, the foal must be registered with the Racing Commission or official registering agency. The registration form must contain the following information: the date, the name of the owner of the foaling dam, the jockey club registration number of the foaling broodmare, the date that the foal was born, an owner’s statement that the foal was born in Minnesota, and the signature and veterinary license number of the veterinarian submitting the report. 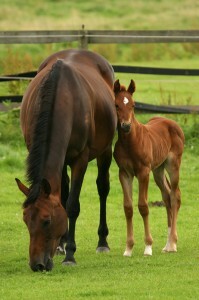 Failure to submit the veterinarian’s report will disqualify any subsequent claim to register the foal as Minnesota-bred. You can find all of the necessary forms for registering mares, stallions and foals at the Minnesota Racing Commission’s website!